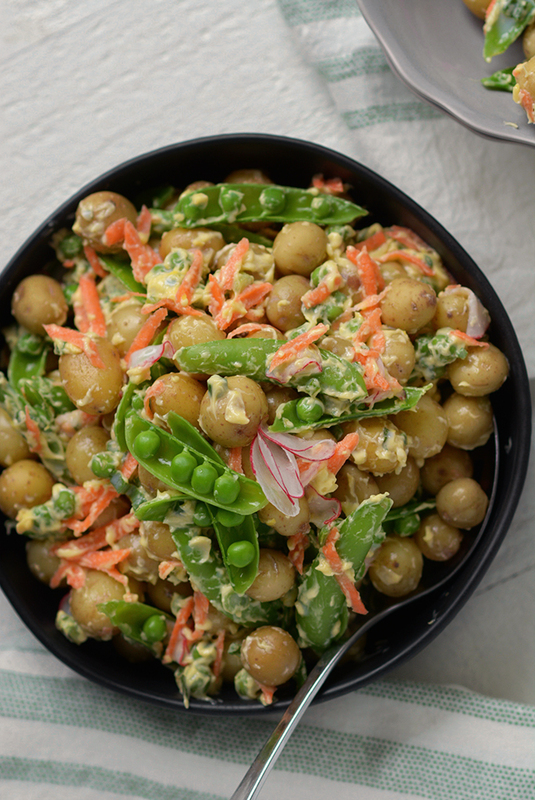 Spring Vegetable Crème Fraîche Potato Salad – Even if spring has not quite yet sprung, this fresh, flavorful salad with a zesty dressing will put you in the mood for sunshine and daffodils! Easter really snuck up on me this year. I suppose that’s because we celebrated it pretty early. It hardly seemed like the daffodils would be blooming and the birds would be tweeting as early as April 1st! I had bought my 16-month-old an adorable Easter outfit which is an overall set with knee socks. When I put it on him he looks like he should be chasing frogs and butterflies in an English garden. In truth we ended up bundling up in sweaters and boots. The crocuses were just barely peeking out of the cold ground and then they were buried the next morning in an inch of snow! All that to say, I’m just getting over my St. Patty’s Day hearty Lamb Shepherd’s Pie and tasty Mint Chocolate Chip Cupcakes. But it’s time to embrace spring – fresh foods and what (hopefully) will be lots of warm weather with flowers and bunnies outside! 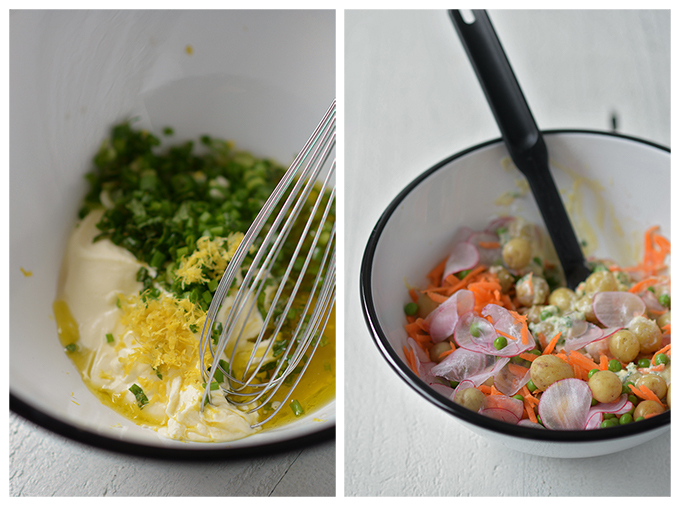 To get in the spring mood I’ve created this Spring Vegetable Crème Fraîche Potato Salad. Crème Fraîche and lemon make this potato salad taste bright and fresh. If you’ve never had crème fraîche before, it’s most similar to sour cream, but it’s richer and creamier. I’ve seen it utilized often in European cooking. America hasn’t quite caught on yet, but I’m hoping to see it more in the future! If you’re not sure where to find it, it’s available in many specialty and gourmet food stores, and Whole Foods Market always seems to have it in stock. 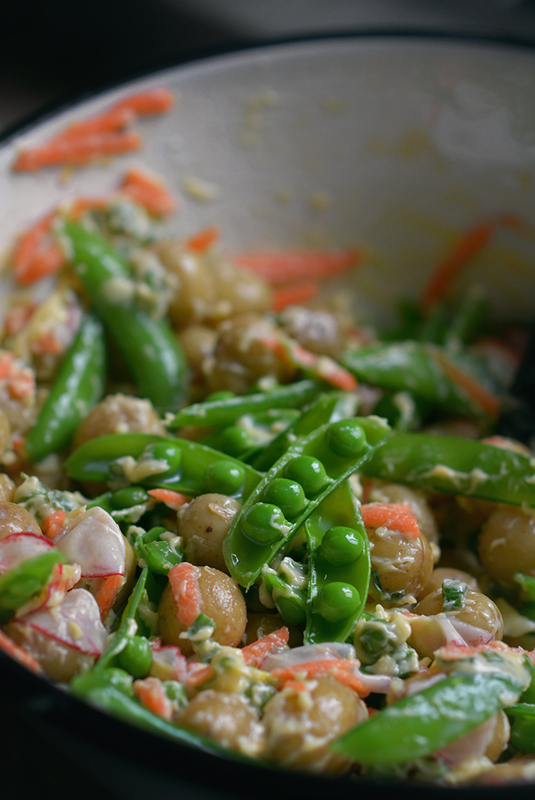 To add to the freshness of this potato salad I added a bunch of fresh spring vegetables and fresh herbs to the mix. 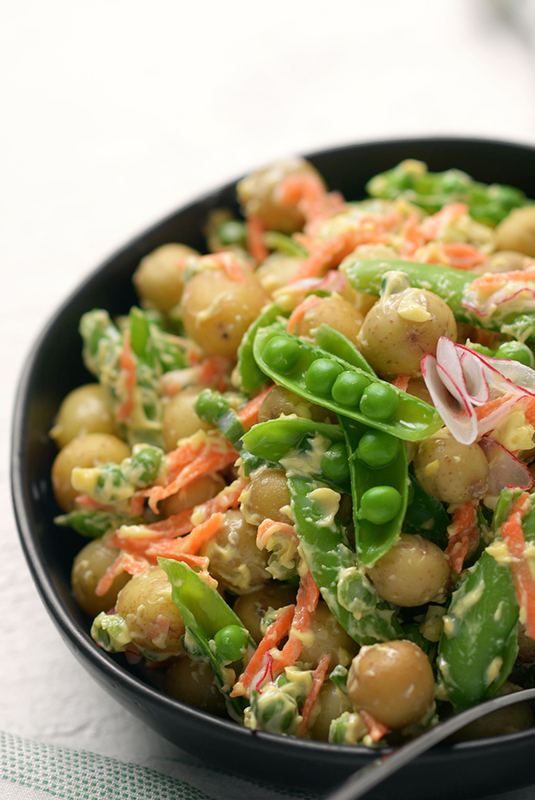 The bright dressing, plus the colorful spring vegetables makes the salad look and taste perfectly springy. Even if it’s still a bit chilly outside, this salad will bring spring to your kitchen table! Clean the potatoes and place them in a pot of cold water. Bring to a boil and then reduce the heat to a gentle simmer. Simmer for 15-20 minutes. This cooking time is the average for new potatoes. The time can vary widely based on the size of your potatoes. They are done when they are just fork tender. Take care not to over cook. Once cooked, strain them and run them under cold water to stop the cooking process. Cut each potato into bite sized pieces if needed. Meanwhile, bring a smaller pot of water to a boil. Wash and de-string the sugar snap peas. Prepare an ice bath with a tray of ice cubs and cold water in a bowl. Blanch the sugar snap peas and fresh peas by adding them to the boiling water for one minute and then immediately add them to the ice bath. Once cooled, remove them and open each pea pod leaving the peas intact and set them aside. In a large mixing bowl, while the potatoes are cooking, make the dressing. Whisk together crème fraîche, olive oil, white wine vinegar, lemon zest, green onion, chives, mint, and salt. Add the cooled potatoes and grated carrots to the bowl and stir until the salad is evenly coated. Next add the peas to the bowl and gently fold them in so that they don't fall apart. Season with black pepper to taste and garnish with radishes and fresh herbs. Be sure to add the radishes right before serving as they will release water into the salad if they sit. 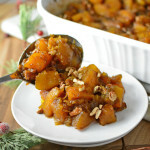 Serve immediately or store in the refrigerator for up to five days. *If you’re unable to find new potatoes you can also use baby potatoes. You will have to cook them longer and then once cooked, cut them in halves or quarters for your salad. **You can substitute with thawed frozen peas. There is no need to blanche the frozen peas. I was just thinking of potato salad yesterday. Now that it’s spring I sure will be making it more often for BBQ and those events. 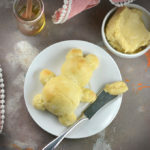 Going to try this recipe soon. Sounds yum! this sounds like a lovely idea for a potluck or picnic. Those potatoes are the cutest! So tiny. I love potato salad but mine never looks this fancy. This would be so perfect for a nice brunch or shower! Can’t wait to try it. 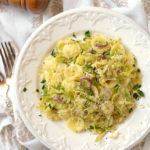 The dressing on this potato salad sounds delish, love all the flavors. 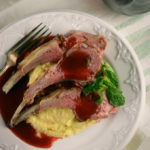 This is a perfect dish to bring to a Memorial Day BBQ! I don’t often eat potatoes anymore, but they are my absolute favorite. 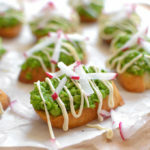 I will have to justify indulging in them just for this creamy sauce and those beautiful pea pods and radishes. 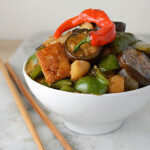 Fantastic dish that I am pinning immediately! What a wonderful, light salad to enjoy this spring! I love the vegetables and the easy, creamy dressing! Can’t wait to try it! This is a perfect salad for any springtime or summer gathering! I love the flavor combination you have in the dressing! Pinned. 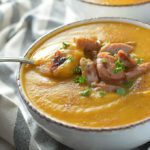 We are getting ready to have our first crawfish and barbecue party of the year and I’ve been searching for recipes to make for a hungry crowd. I’ve always wanted to make this version of a potato salad. It’s on my list, yum! 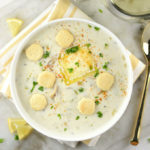 What a delicious, bright, spring-flavor-packed dish! 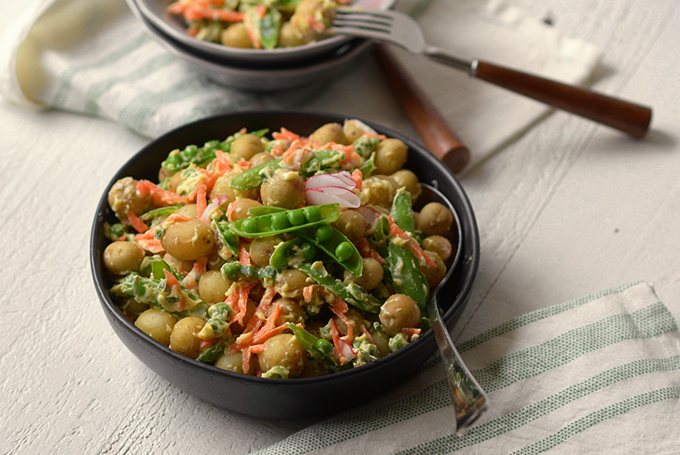 Now that it’s finally warm enough here to grill, we’re breaking out the potato salads. We’ll definitely be adding this to our line up. This is such a pretty salad that’s perfect for spring! I love the addition of creme fraiche too. 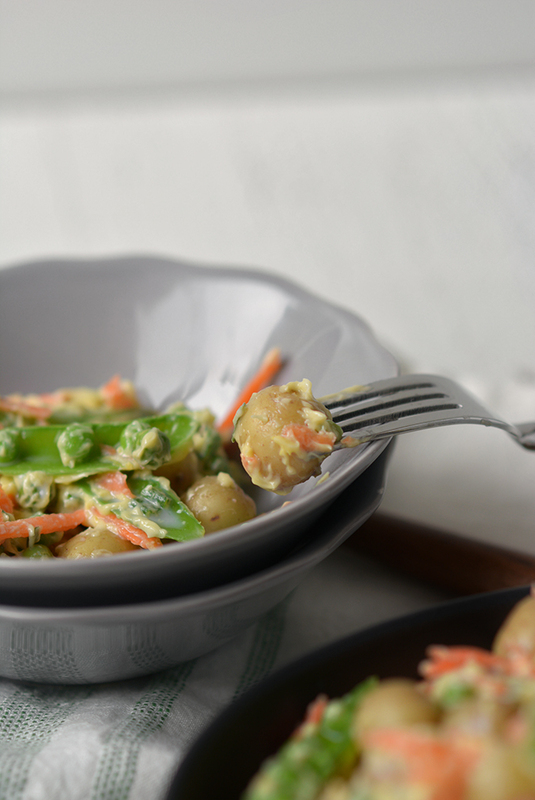 This is such a delicious combination, and I especially love the fresh herbs and bright, cheerful spring peas! 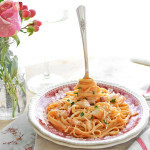 Definitely the kind of dish we need to usher in warmer weather!